Prawn curry or prawns curry here in this post is a gravy based masala prawn curry made using shrimp in south indian style. A video is also posted for prawns curry below and please leave your feedback below for any queries on this recipe. There are many more non veg curries on the blog like mutton curry, chicken curry, egg curry, mutton gravy etc which can be prepared for several occasions and ceremonies and some special recipes in non vegetarian section that could be easily tried from this blog. In andhra, telangana, kerala and goan regions prawns curry is commonly made and served with rice. Fish and prawn curries are usually common in coastal regions. I have made prawns recipe by using coconut and hopefully I post more and more prawn recipes without coconut and other prawn related recipes. 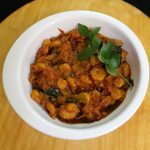 One prawn recipe that is a commonly read and viewed on my blog is prawns fry and I have got another interesting south indian style prawn curry for my viewers that can be served with steamed rice. Making prawns is very easy but to clean and devein the prawns is a very tedious process. Cleaning prawns by deveining is a very important step as eating prawns without deveining causes severe health issues. Make sure to devein them prior to making any prawn recipe. Prawns are quick in cooking and they take not more than 15 minutes to get cooked and they taste delicious in any form of cooking such as prawns fry or prawns curry. In this recipe I have added onions, tomatoes, coconut to make it a gravy form of curry. 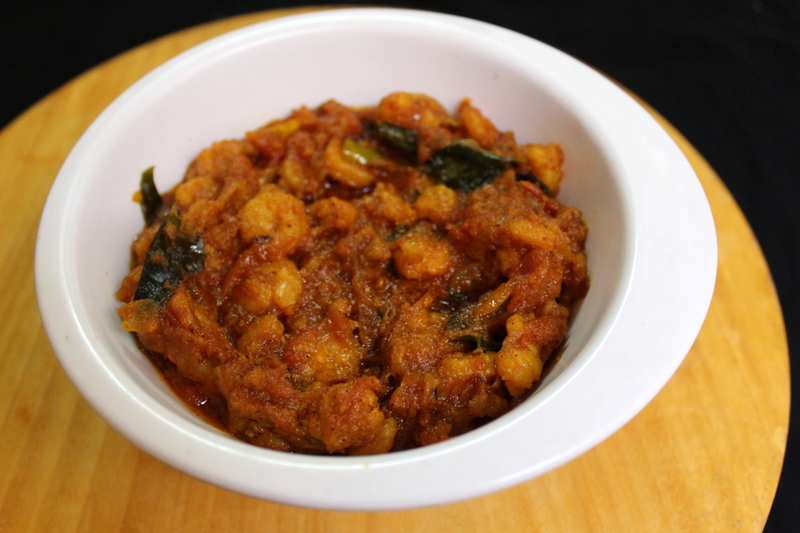 This form or prawn masala curry tastes yum with rice. Firstly, we need to clean the prawns well, saute them in salt and turmeric powder for few minutes and then we need to add these prawns into the onion, tomato and coconut gravy. It is a very easy recipe and can be made without any difficulty. Seafood is always delicious in any form and every non vegetarian wishes to have seafood like fish, prawns/shrimp in any form but seafood should be well cleaned before using it. Let us learn the recipe in written format and also with step by step procedure with the help of a video. 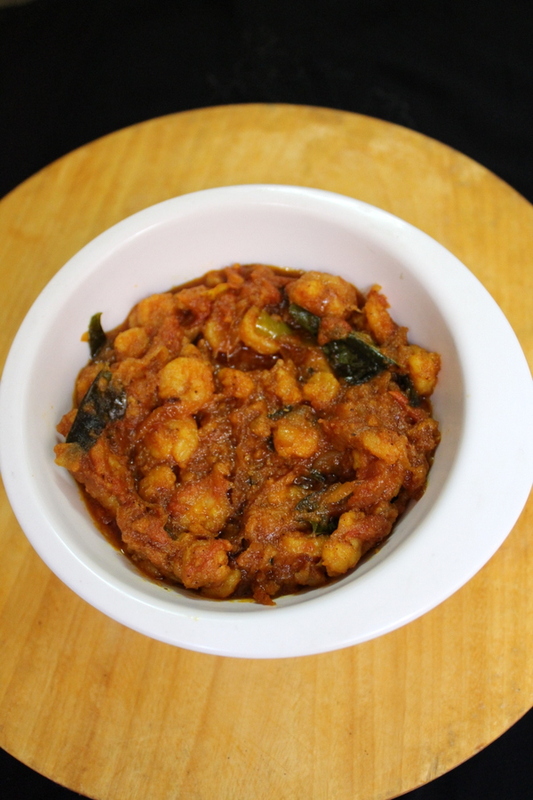 A south indian style prawns curry recipe made using onions, tomatoes and coconut. Add prawns, add salt and turmeric powder, mix well. Saute the prawns until the water gets absorbed and cook for 5-10 minutes. Switch off the flame and rest the prawns aside for later use. In a separate wok, add oil and heat it. Add green chillies, add sliced onions and cook the onions until they turn soft. Add salt as per taste, ginger garlic paste and saute until raw smell of ginger garlic paste disappears. Add chopped tomatoes, mix well. Add red chilli powder, roasted coriander seeds powder, mix well and cook the masala until oil leaves the sides. Add coconut powder, mix well and cook the gravy for few minutes. 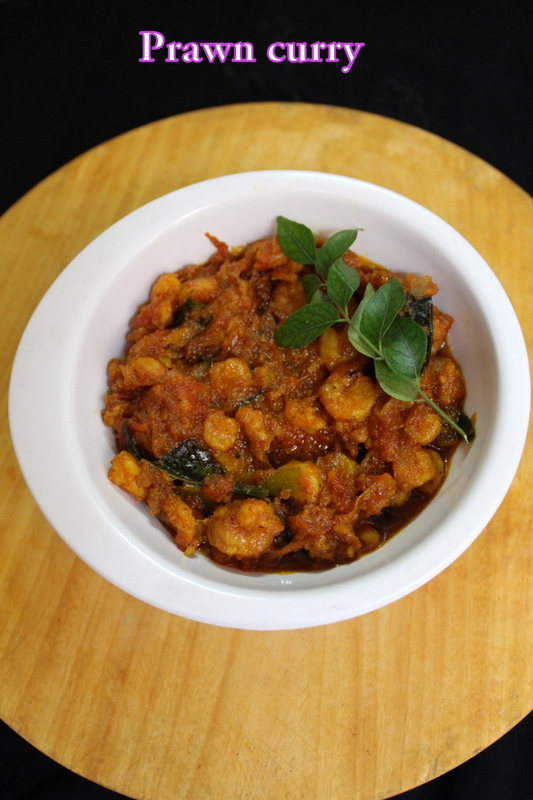 Add the sauteed prawns into the masala gravy, mix carefully and cook for 4-5 minutes. Add curry leaves, coriander leaves, mix well and cook the gravy on low flame for few minutes until oil appears at the sides. Serve the prawn curry masala with steamed rice. 1.In this recipe I have added coconut in powdered form but if you have coconut milk then go ahead and add it instead of coconut powder. 2.Cleaning of prawns well is a very important step mainly deveining the prawns.